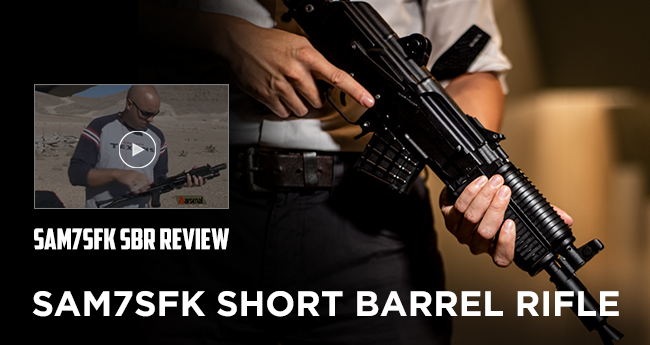 Arsenal, Inc. > Arsenal Weekly, featuring the SAM7SFK SBR! The SAM7SFK-72 - is an Arsenal Inc. factory SBR in an authentic Krinkov configuration with a Bulgarian milled receiver chambered in 7.62x39 mm caliber. Every component is engineered to provide decades of dependable service. The SAM7SFK-72 SBR is ideal for those that want a truly authentic factory Krink with the quality Arsenal is known for. Featuring an 8.5” short barrel, factory tuned short gas system, and front sight block / gas combination (Krinkov or AKS-74U), this SBR is a heavy-duty package in a compact size. The right-side folding metal tubular stock allows for compact storage or carry and the pistol grip is made to work with the ambidextrous safety lever and allows the shooter to operate the safety even when the buttstock is in the folded position. Using a double hook Arsenal trigger that is extremely smooth and breaks at around 4 lbs., you won’t get tired of shooting this rifle for precision shots or just plinking at the range. Each SAM7SFK-72 SBR receiver is milled from a hot-die hammer forged receiver blank by Arsenal, Bulgaria and after 5.5 hours of milling in a hot-die hammer forge, the result is easy to see - a high grade receiver built to last.